Our Mission Is To Furnish The Highest Quality Home Care Service. ​Live-in Private Nurse support you with your day-to-day living, including help with your morning and evening routines, such as dressing and bathing, well as administering medication and meal preparation. Live-in Nurse is charge at monthly basis, meals and accommodation must be provided by hiring Employer. Work will stop at 10 pm and resume at 7 am. The nurse must be given a continues sleep when she/he rest in case an emergency calls during night time on daytime the nurse must sleep equivalent to night rest. This service is applicable to patient that does not wake up frequently during night time. Working on day-off is a different pay. Live-out Private Nurse provides respite care, whether it’s just for a few hours or for longer. The Care at Home service provides you and your loved ones with the peace of mind needed, knowing you are supported and cared for when they can’t be around. Our available shifts are 10 hours, 12 hours or 24 hours nursing care and clients will choose on their hours of preferences. This care service is charge at hourly rate, it varies as well with the distance of client house were transportation can be demanded sometimes if no public transport with in the area. Meals should be provided by the client one time during the working hours this could be lunch or dinner. Please choose how many hours of care you wanted to engage for the patient care. The part time nurse service covers a minimum of 1-2 hours nursing service and the rate is charged at per visit for any procedural done. We accept 4-6 hours demand but at a different price, still we charge it at an hourly rate. ALL PRICING ARE BASED ON PATIENT'S CONDITION UPON ASSESSMENT. 1. Personal hygiene and grooming-this includes bathing, oral care, changing diapers, dirty clothing’s and linens to clean one. 9. Insertion and feeding of Naso Gastric Tube, TPN feeding and administration, PEG feeding and management. 12. Proper technique in transferring patient from bed to wheelchair, to car and lifting. 15. Proper nursing techniques and education a road to recovery to help patient obtain self-independent if the nurse will leave them. 16. Everyday report of assessment to families. For Clients living in other states we only provide Live-in Private Nurse Service. Our service provides one nurse throughout the contract to work with the family whether for short term or long term care. DO YOU NEED CARE AND SUPPORT AT HOME? We offer a free, no obligation care assessment. During the interviews before proceeding with the job we will visit patient and carry out a full assessment of your care needs. Alternatively, if you need care and you would like to speak to us directly, please contact now. 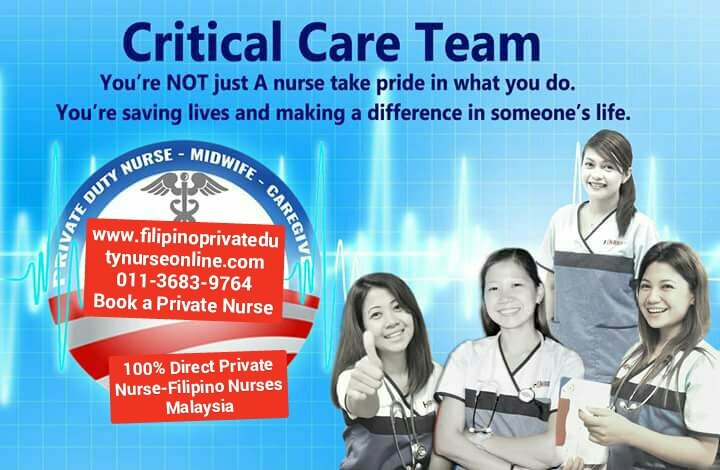 Private Nurse Service, Home Nurses, Elderly Care, Caregivers, private nurse services malaysia, private nurse Klang, private nurse Shah Alam, private nurse Bangsar, private nurse ipoh perak, private nurse johor bahru, private nurse petaling jaya.